Oh, "Cars" – who would have thought that Pixar's most uninspired, bland commercial release would end up being one of its most popular? From the animation studio that brought to life some of the most genuinely inspirational and enjoyable movies to the big screen, from "Toy Story" to "Finding Nemo" to "Wall-E," and among them, "Cars" is kind of the most snooze-worthy. And yet that movie was a massive hit and remains a popular choice for kids – it's so popular that it inspired a spin-off, the recently released Disney film "Planes." 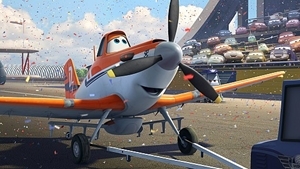 While "Planes" isn't a Pixar production, it has the same look and feel as its predecessors and is meant to be the first film in a trilogy. Comedian Dane Cook is the voice of Dusty Crophopper, a cropduster plane with big dreams of entering an international competition filled with bigger, more impressive planes. Will Dusty make his aspirations for a grander life take flight, or will he be stuck at home in his ho-hum job for the rest of his days? To get help in the around-the-world race, he turns to a World War II bomber, Skipper (Stacy Keach), and relies on support from trusted friends like his truck pal Chug (Brad Garrett) and Dottie (Teri Hatcher), a forklift. "Planes" may take to the skies where "Cars" kept to the ground, but the plot hardly soars and ultimately lacks the charm that made the latter bearable to watch. Chances are as a father, you've had to sit through Disney's "Cars" and the follow-up, "Cars 2," more times than you can count. In fact, you may even find yourself sitting through a Larry the Cable Guy TV special and have trouble distinguishing him from Mater – it's seriously that bad. So when it comes to "Planes," it's not so much a matter of if you should take your kids. As a spin-off of the "Cars" franchise, this is sure to be a big hit in the sandbox for those final weeks of summer. Instead, it's really just a question of how much you can endure, especially if you're a single father. Children of all ages are going to have a blast with this one, and while they're busy giggling in the seats beside you, don't be surprised if you have to struggle just to keep your eyes open. Take this an opportunity to hog the soda (what do your kids need the sugar for anyway?) and just try to remember, it'll be over soon!